RePosted from The Resurgence blog. 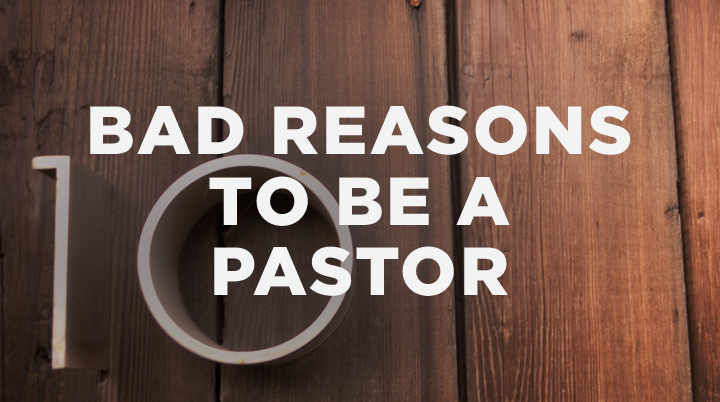 There are some good reasons to be a pastor, and there are some reasons that just aren’t enough. This is the third installment in an 8-part series calledPreparing to Lead. Pastoral ministry isn’t so much a job as it is a lifestyle. The pastor is on call 24 hours a day, 7 days a week, and 365 days a year. This doesn’t mean you can’t or shouldn’t have some set hours, a day off, or vacation. It just means you’re likely to be interrupted by emergencies on a regular basis. The hours are long. The work may not be physical, but it is emotional and spiritual, and it is all-encompassing and exhausting. I wish I had better news for you here. I am a strong believer that longevity is important for pastoral influence. But the sad reality is that pastors change churches and churches change pastors. One trusted researcher found that the average tenure of a pastor in America is three and a half years. Add to that factor the harsh reality that in many churches, financial uncertainties may result in interrupted pay cycles, salary reductions, and layoffs. Instability is the norm for most pastors. Much of pastoral ministry is about conflict. There is resistance to Jesus from within, and even from your own heart. Then there is persecution from without. Every inch that the Kingdom of God advances is tenaciously defended. Maybe the most ironic aspect of pastoral ministry is how challenging it can be to prioritize your time with Jesus. Respect is required for a pastor, according to Scripture. He is to be respected in his home, in his church, and among outsiders (1 Tim. 3:4, 7). But respect can be hard to come by, and the man who moves into ministry to win the approval of others is sure to fail miserably (Gal. 1:10). You should want to be used by Jesus to draw attention to him. But how you go about doing just that is really important. You don’t have to have a pulpit. You don’t have to be loud. The best way to spread his fame is still the biblical way: “Aspire to live quietly, and to mind your own affairs, and to work with your hands, as we instructed you, so that you may walk properly before outsiders and be dependent on no one” (1 Thess. 4:11–12).